The iOS Wallet app allows users to store digital passes on their devices. These passes are generated by merchants and sent to the customer via email, URLs, or through the merchant's own iOS app. These passes can represent various things, from movie tickets to loyalty cards to boarding passes. 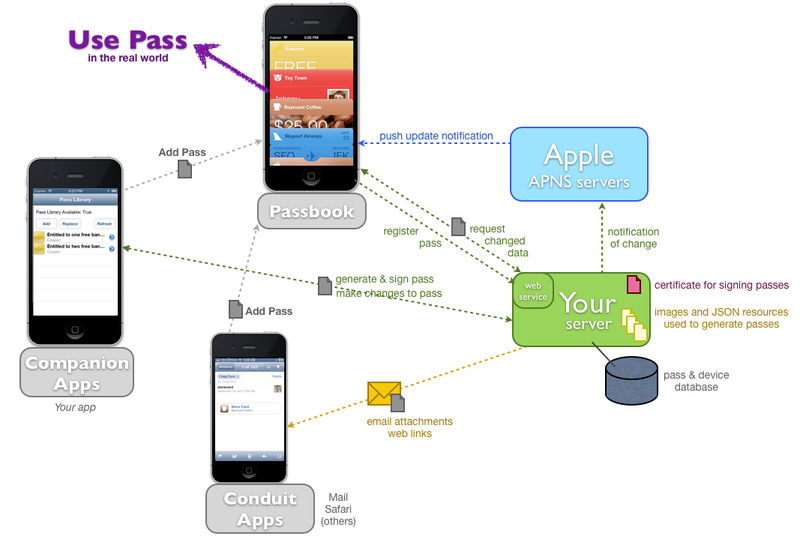 The PassKit framework allows developers to interact with passes programmatically. 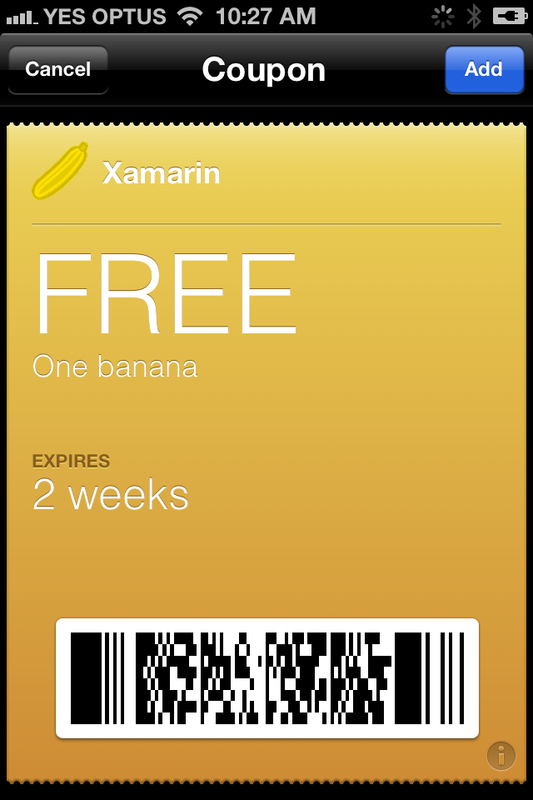 This document introduces Wallet and using the PassKit API with Xamarin.iOS. The PassKit features discussed in this document require iOS 6 and Xcode 4.5, along with Xamarin.iOS 6.0. Buying movie tickets online – Customers are typically emailed a barcode that represents their tickets. This barcode is printed and taken to the cinema to be scanned for entry. Loyalty cards – Customers carry a number of different store-specific cards in their wallet or purse, for display and scanning when they purchase goods. Coupons – Coupons are distributed via email, as printable web pages, through letterboxes and as barcodes in newspapers and magazines. Customers bring them to a store for scanning, to receive goods, services or discounts in return. Boarding passes – Similar to buying a movie ticket. Movie tickets – After purchase, the customer adds an event ticket pass (via email or a website link). As the time for the movie approaches, the pass will automatically appear on the lock-screen as a reminder, and on arrival at the cinema the pass is easily retrieved and displayed in Wallet for scanning. Loyalty cards – Rather than (or in addition to) providing a physical card, stores can issue (via email or after a website login) a Store Card Pass. The store can provide additional features such as updating the balance of the account on the pass via push notifications, and using geolocation services the pass could automatically appear on the lock-screen when the customer is near a store location. 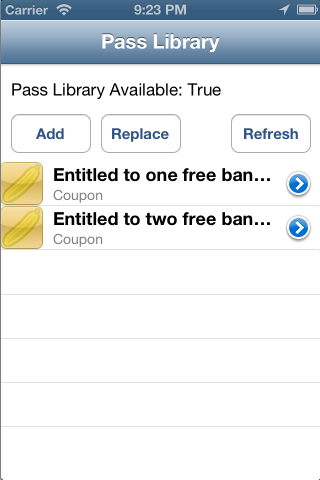 Coupons – Coupon passes can easily be generated with unique characteristics to help with tracking, and distributed via email or website links. Downloaded coupons can automatically appear on the lock-screen when the user is near a specific location, and/or on a given date (such as when the expiry date is approaching). Because the coupons are stored on the user’s phone, they are always handy and do not get misplaced. Coupons might encourage customers to download Companion Apps because App Store links can be incorporated into the Pass, increasing engagement with the customer. Boarding passes – After an online check-in process, the customer would receive their boarding pass via email or a link. A Companion App provided by the transport provider could include the check-in process, and also allow the customer to perform additional functions like choosing their seat or meal. The transport provider can use push notifications to update the pass if transport is delayed or canceled. As the boarding time approaches the pass will appear on the lock-screen as a reminder and to provide quick access to the Pass. At its core, PassKit provides a simple and convenient way to store and display barcodes on your iOS device. With the additional time and location lock-screen integration, push notifications and Companion Application integrate it offers a foundation for very sophisticated sales, ticketing and billing services. 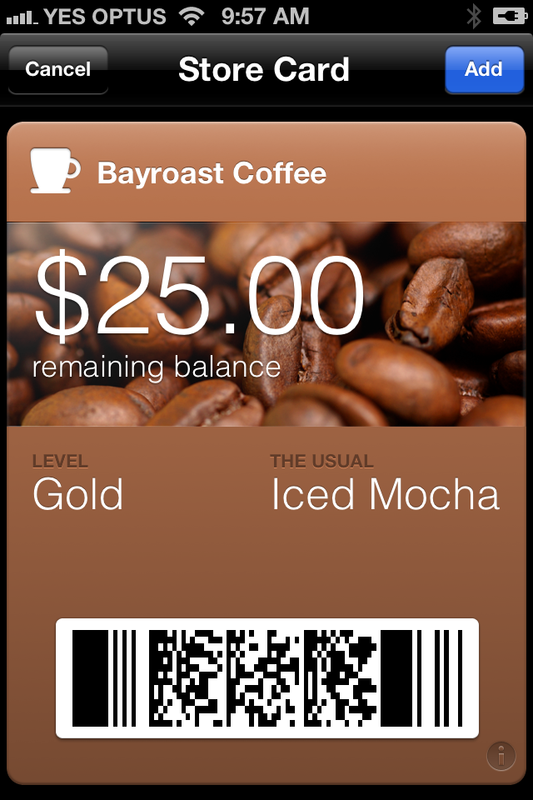 Wallet – Apple’s built-in iOS app that stores and displays passes. This is the only place that passes are rendered for use in the real world (ie the barcode is displayed, along with all the localized data in the pass). 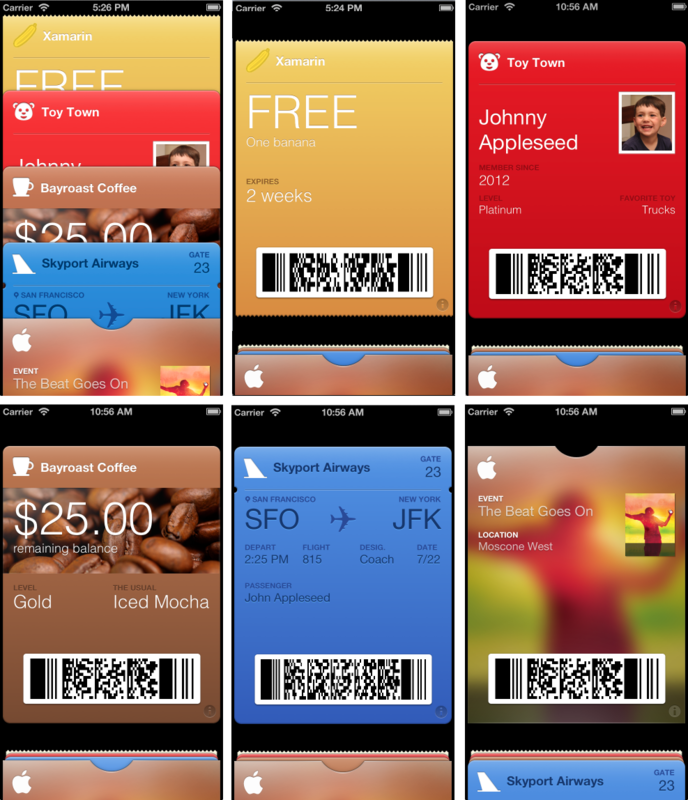 Companion Apps – iOS 6 apps built by pass providers to extend the functionality of the passes they issue, such as adding value to a store card, changing the seat on a boarding pass or other business-specific function. Companion Apps are not required for a pass to be useful. Your server – A secure server where passes can be generated and signed for distribution. Your Companion App may connect to your server to generate new passes or request updates to existing passes. You may optionally implement the web service API that Wallet would call to update passes. APNS Servers – Your server has the ability to notify Wallet of updates to a pass on a given device using APNS. Push a notification to Wallet which will then contact your server for details of the change. Companion apps do not need to implement APNS for this feature (they can listen to the PKPassLibraryDidChangeNotification ). Conduit Apps – Applications that don’t directly manipulate passes (like companion apps do), but which can improve their utility by recognizing passes and allowing them to be added to Wallet. Mail clients, social network browsers and other data aggregation apps may all encounter attachments or links to passes. The entire ecosystem looks complex, so it’s worth noting that some components are optional and much simpler PassKit implementations are possible. A pass is a collection of data representing a ticket, coupon or card. It may be intended for a single use by an individual (and therefore contain details such as a flight number and seat allocation) or it may a multiple use token that can be shared by any number of users (such as a discount coupon). A detailed description is available in Apple’s About Pass Files document. Event Ticket – small semicircular cutout. Boarding Pass – notches in side, transport-specific icon can be specified (eg. bus, train, airplane). Store Card – rounded top, like a credit or debit card. Coupon – perforated along the top. Generic – same as Store Card, rounded top. A pass file is actually a ZIP archive with a .pkpass extension, containing some specific JSON files (required), a variety of image files (optional) as well as localized strings (also optional). pass.json – required. Contains all the information for the pass. manifest.json – required. Contains SHA1 hashes for each file in the pass except the signature file and this file (manifest.json). signature – required. Created by signing the manifest.json file with the certificate generated in the iOS Provisioning Portal. Localizable strings files – optional. teamIdentifier – This links all passes you generate to your App Store account. This value is visible in the iOS Provisioning Portal. passTypeIdentifier – Register in Provisioning Portal to group passes together (if you produce more than one type). For example, a coffee shop might create a store card pass type to allow their customers to earn loyalty credits, but also a separate coupon pass type to create and distribute discount coupons. That same coffee shop might even hold live music events and issue Event Ticket passes for those. serialNumber – A unique string within this passTypeidentifier . The value is opaque to Wallet, but is important for tracking specific passes when communicating with your server. "relevantDate":"2012-09-15T15:15Z",                    //When to show pass on screen. ISO8601 formatted. "key":"h1-label",   //Must be unique. Used by iOS apps to get the data. //that shows in the middle of the pass. Only 2D formats are supported: PDF417, Aztec, QR. Apple claims that 1D barcodes are unsuited to scanning on a backlit phone screen. Alternate text displayed below the barcode is optional – some merchants want to be able to read/type manually. ISO-8859-1 encoding is the most common, check which encoding is used by the scanning systems that will read your passes. Up to 10 locations can be specified in a Pass, eg stores that a customer frequently visits, or the location of a cinema or airport. A customer could set these locations via a Companion App or the provider could determine them from usage data (if collected with the customer’s permission). When the pass is displayed on the lock-screen, a fence is calculated so that when the user leaves the area the pass is hidden from the lock-screen. The radius is tied to pass style to prevent abuse. Only one date/time can be specified in a Pass. The date and time is useful for triggering lock-screen reminders for boarding passes and event tickets. Can be updated via push or via PassKit API, so that the date/time could be updated in the case of a multiple-use ticket (such as a season ticket to a theatre or sporting complex). Translating a pass into multiple languages is similar to localizing an iOS application – create language specific directories with the .lproj extension and place the localized elements inside. Text translations should be entered into a pass.strings file, while localized images should have the same name as the image they replace in the Pass root. Calculate a SHA1 hash for each file in the pass directory (do not include the manifest.json or signature file, neither of which should exist at this stage anyway). Write manifest.json as a JSON key/value list of each filename with its hash. Use the certificate to sign the manifest.json file and write the result to a file called signature . 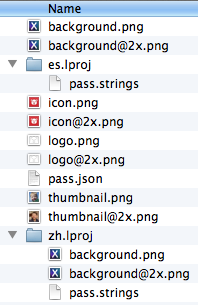 ZIP the everything up and give the resulting file a .pkpass file extension. Because your private key is required to sign the pass, this process should only be done on a secure server that you control. DO NOT distribute your keys to try and generate passes in an application. This section contains instructions to help setup your provisioning details and create your first pass. The pass must be registered using a unique identifier, called the Pass Type ID. A valid Certificate must be generated to sign the pass with the developer's digital signature. To create a Pass Type ID do the following. The first step is to set up a Pass Type ID for each different type of pass to be supported. The Pass ID (or Pass Type identifier) creates a unique identifier for the Pass. We will use this ID to link the pass with your developer account using a Certificate. Confirm the Pass ID by pressing the Register button. Follow the steps to create a Certificate Signing Request (CSR). Press the Continue button on the developer portal and upload the CSR to generate your certificate. Download the certificate and double-click on it to install it in your keychain. 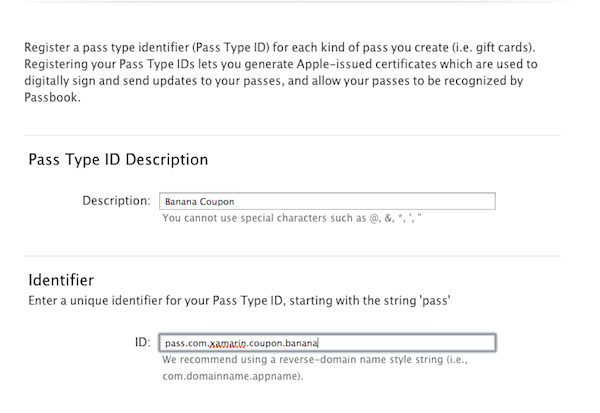 Now that we have created a certificate for this Pass Type ID, the next section describes how to build a pass manually. For more information on Provisioning for Wallet, refer to the Working with Capabilities guide. Create a directory to contain the pass files. Create a pass.json file that contains all the required data. Include images in folder (if required). Calculate SHA1 hashes for every file in the folder, and write to manifest.json. Sign manifest.json with the downloaded certificate .p12 file. ZIP the directory’s contents and rename with .pkpass extension. Open pass.json and edit the JSON. You must at least update the passTypeIdentifier and teamIdentifer to match your Apple Developer account. Next a signature must be generated for this file using the certificate (.p12 file) that was generated for this Pass Type ID. Download the Wallet Seed Support Materials from the Apple Downloads site. Use the signpass tool to turn your folder into a pass (this will also calculate the SHA1 hashes and ZIP the output into a .pkpass file). Normally that process would be automated on a server, however manual pass creation might be an option for small businesses that are only creating coupons that do not require the support of a back-end server. It is the only place that passes are rendered with their barcode for scanning. User can change the settings for updates. If enabled, push notifications can trigger updates to the data in the Pass. User can enable or disable lock-screen integration. If enabled, this allows the pass to automatically appear on their lock screen, based on relevant time and location data embedded in the pass. The reverse side of the pass supports pull-to-refresh, if a web-server-URL is supplied in the pass JSON. Companion Apps can be opened (or downloaded) if the app’s ID is supplied in the pass JSON. Passes can be deleted (with a cute shredding animation). Conduit Apps – These do not manipulate passes directly, they simply load pass files and present the user with the option of adding them to Wallet. Companion Apps – These are written by providers to distribute passes and offer additional functionality to browse or edit them. 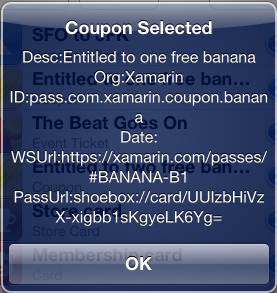 Xamarin.iOS applications have complete access to the PassKit API to create and manipulate passes. Passes can then be added to Wallet using the PKAddPassesViewController. This process is described in more detail in the Companion Applications section of this document. Mail – Recognizes attachment as a Pass. Safari – Recognizes the pass Content-Type when a pass URL link is clicked. Other custom apps – Any app that receive attachments or open links (social media clients, mail readers, etc). 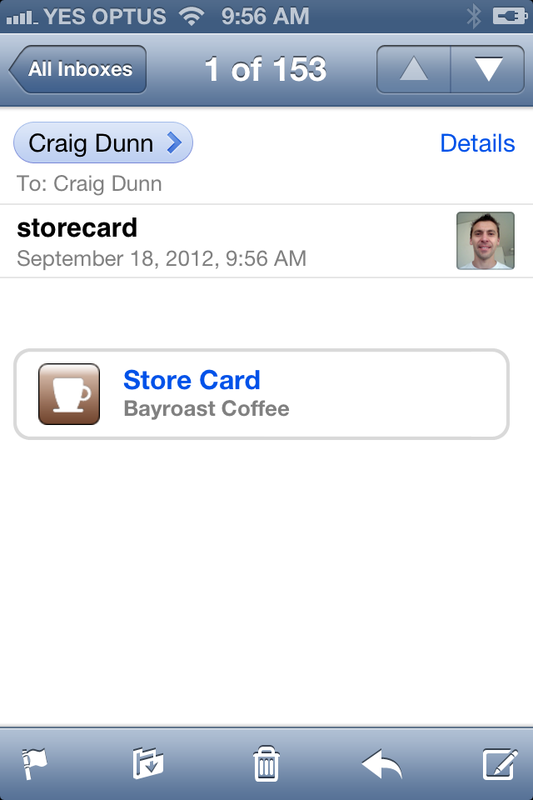 This screenshot shows how Mail in iOS 6 recognizes a pass attachment and (when touched) offers to Add it to Wallet. The basic operation of a conduit application is to retrieve the pass file and call PassKit’s PKAddPassesViewController to give the user the option to add the pass to their Wallet. The implementation of this view controller is covered in the next section on Companion Applications. Conduit Applications do not need to be provisioned for a specific pass Type ID in the same way that Companion Applications do. A companion application provides additional functionality for working with passes, including creating a Pass, updating information associated with a Pass and otherwise managing passes associated with the application. Companion applications should not attempt to duplicate the features of Wallet. They are not intended to display passes for scanning. This remainder of this section describes how to build a basic Companion App that interacts with PassKit. Because Wallet is a store technology, the application needs to be provisioned separately and cannot use Team Provisioning Profile or Wildcard App ID. Refer to the Working with Capabilities guide to create a unique App ID and Provisioning Profile for the Wallet application. 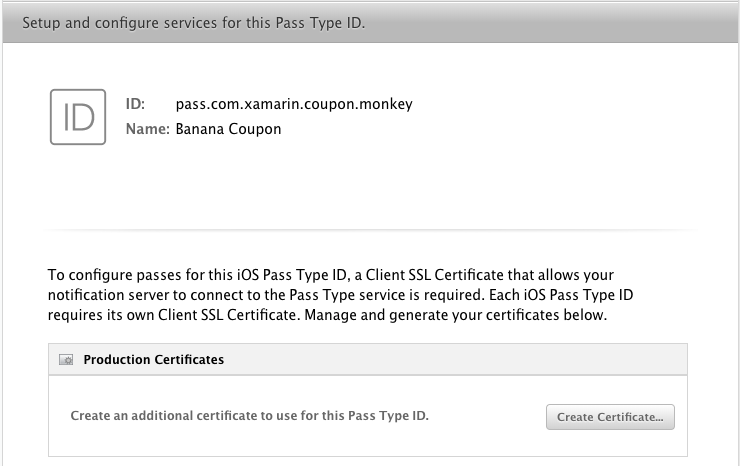 The Entitlements.plist file should be included in all recent Xamarin.iOS project. To add a new Entitlements.plist file, follow the steps in the Working with Entitlements guide. The default option is for your app to allow all pass types. However, it is possible to restrict your app and only allow a subset of team pass types. To enable this select the Allow subset of team pass types and enter the pass type identifier of the subset that you wish to allow. Double-click the Entitlements.plist file to open the XML source file. If you have problems deploying your application, check that you are using the correct Provisioning Profile and that the Entitlements.plist is selected as the Custom entitlements file in the iPhone Bundle Signing options. then the pass-type-identifiers entitlements array is incorrect (or does not match the Provisioning Profile). Verify the Pass Type IDs and your Team ID are correct. PKPass – An instance of a Pass. PKPassLibrary – Provides the API to access the passes on the device. PKAddPassesViewController – Used to display a pass for the user to save in their Wallet. Wallet is not available on the iPad, so applications should check before attempting to access PassKit features. The PassKit library is not a singleton, applications should create and store and instance to access the PassKit API. Applications can request a list of passes from the library. This list is automatically filtered by PassKit, so that you can only see passes that have been created with your Team ID and which are listed in your Entitlements. A limited set of information is available for rendering of passes within companion apps. Choose from this set of standard properties to display lists of passes, as the example code does. You can also use the LocalizedValueForFieldKey() method to retrieve data from fields in the passes you have designed (since you will know what fields should be present). The example code does not show this. Replacing an existing pass does not require the user’s permission, however it will fail if the pass does not already exist. PKPass isn’t mutable, so you cannot update pass objects in your code. To alter the data in a pass an application must have access to a web server that can keep a record of passes and generate a new pass file with updated values which the application can download. Pass file creation must be done on a server because passes must be signed with a certificate that must be kept private and secure. Once an updated pass file has been generated, use the Replace method to overwrite the old data on the device. Applications can listen for changes being made to the Pass Library using the PKPassLibraryDidChangeNotification. Changes could be caused by notifications triggering updates in the background, so it is good practice to listen for them in your app. It is important to pass a library instance when registering for the notification because PKPassLibrary is not a singleton. A detailed discussion of building a server application to support PassKit is beyond the scope of this introductory article. See dotnet-passbook open source C# server-side code. A detailed discussion of using push notifications to update passes is beyond the scope of this introductory article. You would be required to implement the REST-like API defined by Apple to respond to web requests from Wallet when updates are required. See Apple's Updating a Pass guide for more information. This article introduced PassKit, outlined some of the reasons why it is useful and described the different parts that must be implemented for a full PassKit solution. It described the steps required to configure your Apple Developer account to create passes, the process to make a pass manually and also how to access the PassKit APIs from a Xamarin.iOS application.